In 1980, Pop sensation group The Vapors released their hit song “Turning Japanese”. Thankfully, they weren’t advising us to invest in the Japanese stock market when they wrote the song. That’s a good thing, having seen what the Nikki has done since the song’s release (now just slightly ahead of the 1980 level). Actually, when reading the lyrics it’s hard to decide what they were referring to, as it makes no reference to Japanese lifestyle or customs. Google the lyrics and you’ll see what I mean. Whatever the case, when it comes to world stock markets it would appear that stock investors are indeed “turning Japanese” – at least from the perspective of technical analysis. The long termed chart for the Nikki is demonstrating an interesting breakout from a weak downtrend that began shortly after a brief rally from the 2008/2009 crash. This breakout may be bullish, especially if it breaks current overhead resistance of 12,000 in the near term. If the Nikki can carry its momentum into the next level of significant resistance, it would target somewhere around 14,000, representing just under 20% upside potential. The daily chart is equally encouraging. 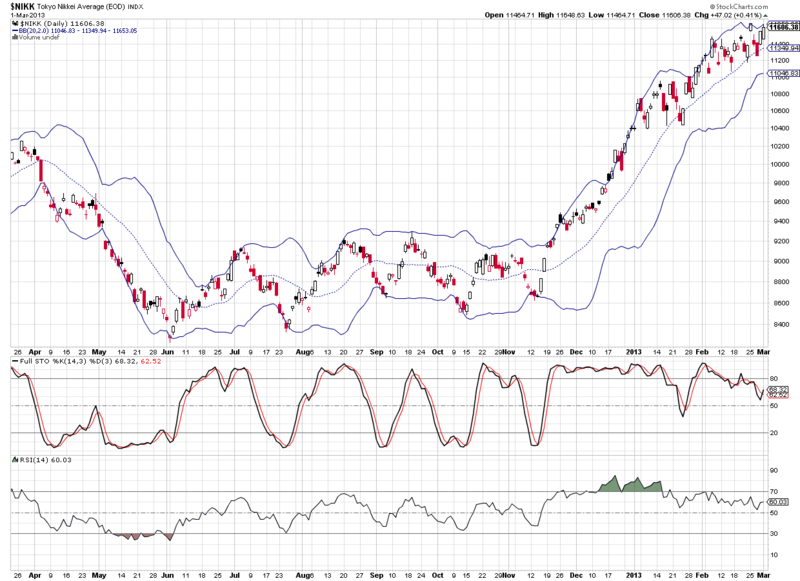 The index continues to ride the top of its Bollinger bands, while showing no signs of breaking its trend. Momentum indicators are neutral, again suggesting no signs of a pending serious correction. We can compare the Nikki to the S&P500, which has been in an uptrend since 2009. While normally we want to be long the market that’s in an uptrend, the S&P is now approaching a major level of overhead resistance at 1550-ish, as shown on the chart. I’ve been talking about that level as an ultimate target point for many years, as both my clients and blog readers will be aware. In comparison, the Nikki doesn’t really have any serious overhead resistance coming up for a while, beyond the less significant pressure at 12,000. The near termed daily chart for the S&P500 is also painting a less favourable picture for the S&P when compared to the Nikki. Recent activity shows a choppy pattern, with no higher highs and an ugly black candle last week. A small triangle appears to be forming on the S&P500. This is a neutral formation until a breakout occurs on either side. So the picture for the S&P is neartermed neutral, vs. the Nikki which leans towards the bullish side. All in, there will be some influence by any weakness in North American stock markets on most other major indices. However, these two markets have not been highly correlated over the past few years – as you can easily see on the charts (S&P500 up, Nikki down since 2009). Thus, my bet is that the Nikki may be a better place to be in the coming year – at least on a relative strength basis – given its recent breakout and chart patterns. From an investment point of view, I must agree with the Vapors. I think I’m turning Japanese. Visit www.valuetrend.ca and click on the performance tab to see our newest performance numbers. Do you also see a topping out of the NDX? Although it’s well above its 2007 highs, it looks like a head and shoulder pattern has formed since the start of 2012. Also, RSI on the daily $NIKK chart looks to be diverging. Is there a concern there? I am seeing a definite divergence in the Nikki since the middle of January, in MACD, RSI and Full Stoch. It needs to stay over 12,000 to defy the momentum warnings. Love your analysis Keith but 1996? I vividly remember that song from junior high circa 1980/81. “I really think so.” Keep up the great work. Cheers. I dont know where I got the 1996 date from–but I am changing it on my blog to reflect the proper date of 1980.